Just East of Eden. . .
...there is a tropical paradise where its trim, slender inhabitants live longer than anywhere on earth, and enjoy lives virtually free of disease or discomfort. Yet, the secret of this Shangri La lies not in its location, or even in the gene pool of the community of people who live here, but in the amazing, health-generating power of their unique diet. Extensive scientific research has distilled the essence of this super-diet to a single, inexpensive food that is easily obtainable almost everywhere in the world, and has one of the longest shelf-lives ever recorded. Still, there is less than a 1 percent chance that it is one of the foods you are currently eating. But, when added to your diet, through the process suggested in this step-by-step presentation, it can help you to easily return to your ideal weight and maintain it for a lifetime. 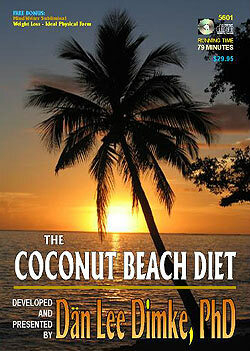 How does The Coconut Beach Diet succeed when so many other miracle diets have failed? The secret, in a word, is satisfaction. A few days after adding this special food to your daily diet, your hunger will begin to naturally diminish until it all but disappears. Though eating continues to be enjoyable, it is no longer mandatory. Once the siren song of hunger falls silent, then suddenly, "what", "when", and "how much" you eat is returned to your conscious control. This allows you to easily adjust the intake of your favorite foods to the just amount needed to gradually return you to your ideal weight in a simple, safe and natural process. And, because there is no need to give up the foods you love, this is a healthful and satisfying diet that you can continue to enjoy comfortably for the rest of your life. If you are interested in more than mere weight loss, and would also like to have better health and a longer life, The Coconut Beach Diet offers a long list of many other surprising benefits that we will explore in detail in this presentation. In short, The Coconut Beach Diet will show you how to improve your health, extend your life expectancy, reach your ideal weight and easily maintain it for a lifetime, without hunger, exercise or calorie-counting, while continuing to enjoy your favorite foods. This audio presentation is your personal passport to Coconut Beach. Won't you accept this invitation to rediscover the slim, vibrant person within you, now? You can easily remove shopping cart items later.